We delivered 74 'Days for Girls' kits to students at the Queen Esther School. The recipients were chosen by the principal of the school based on need and responsibility. Linda Burgoon, Tina Johnson, Beth Strand and Veronica Kutta made sure that each girl knew how to use each part of the kit and understood what needed to be done to ensure maximum longevity. We feel confident that the kits will help each recipient for multiple years to come. Thank you to everyone who cut or ironed fabric, sewed the bags, or assembled the kits. Special thanks to Aleta Deyo and the Fabric Design students at Mt. Ida College for sewing the shields and the liners and to Paula Passi McCue, Linda Burgoon and Tina Johnson for organizing all the parts of the process. Our underwear drive was so successful that after supplying every girl at the Queen Esther school with a new pair of underwear, we were also able to fill a large bag with underwear for girls taking technical training at the local hospital or the diocese owned health clinic. The response to our request for over-the-counter medical supplies was overwhelming! We were able to send some supplies to Haiti with Jon and Sarah Strand and Rob and Maggie Young and still have a full duffel that we took to Tanzania. Beth and Veronica worked with the nurse at the school to stock what she thought they needed (ibuprofen, band-aids, neosporin, hydrocortisone, anti-diarrheal meds). We still had enough left over to add to the stock at St. Luke's clinic. This clinic is owned by the diocese and provides a full range of medical services in conjunction with the local hospital next door. Many, many people will benefit from your donations! Your monetary contributions were instrumental in the mission's success. We are grateful for the support of the two Deanery grants which served as the foundation for this trip. You helped if you attended the St. Patrick's day fundraiser. Many of you made separate monetary donations which helped defray some hotel and restaurant expenses. But the best part was that your generosity allowed us to present monetary gifts to the women's groups at the 3 churches we visited. These groups, called Mother's Unions, seem to 'do it all'. Each group had their own area of special interest. One wanted to rebuild a kitchen hut that had been demolished during a flood. Another group focused on early childhood education. It was very clear that our gifts, although small by our standards, meant the world to them. Another monetary donation went to the diocese level Mother's Union, which is heading up the hostel project that provides housing for girls getting technical training for jobs at the hospital and clinic. The first 'dorm' has been completed housing 24 girls, but there are plans for additional structures that will house 80 young women. 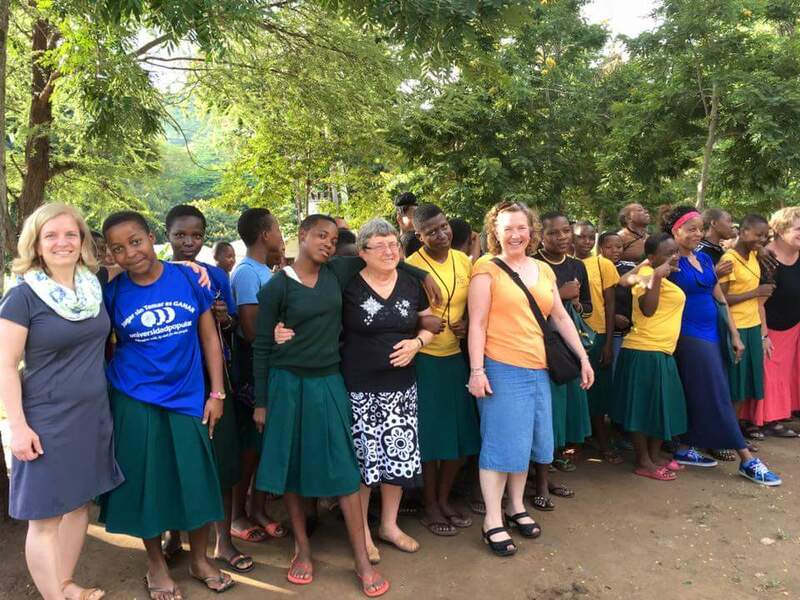 The theme of our mission trip was to empower the young women at the Queen Esther school. Your support allowed us to help many women throughout the diocese. We heard your prayers and felt your love and they carried us through some long drives and longer days. Thank you from the bottom of our hearts.